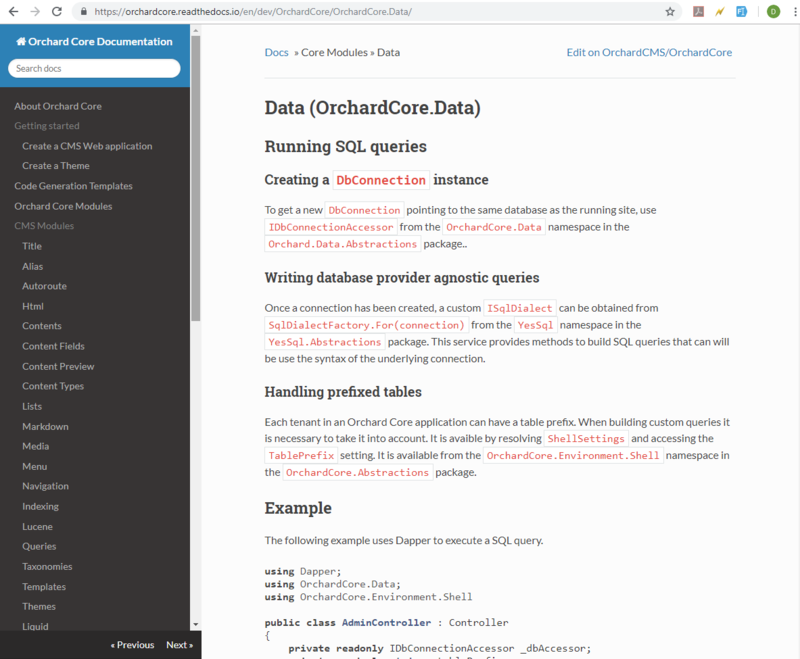 The OrchardCore.Data module has got several fixes lately and gets a new documentation about how to create a new DbConnection instance, write database provider agnostic queries and so on. You can read the documentation on Read the Docs. widgets in the layer with isHomepage rule is only visible on the home page. to show widgets only for anonymus users use the isAnonymous rule. use isAuthenticated rule to show widgets for authenticated users. if you need a layer just for a given URL, you can use the url rule, where you can use the * expression, like: url("/mylist/page-*"), where the rule will be apply for any URL that starts with /mylist/page-. the new one is the culture rule that we at Lombiq contributed, that gets the culture used by the current thread and shows the widgets in the given layer. Let's say that the layer rule is the following: culture("fr"). In this case if the request culture is "fr" or "fr-CA", the widgets on this layer will be shown. If you open the Assets or try to insert media items using a WYSIWYG editor, in some cases the scroll bar doesn't appear, that is not so user friendly. A bigger problem was when a media folder has too many documents the Media Gallery tries to render/download them all thus causing the stack overflow exception. Now you will see the scroll bar. There is also a pager to navigate to the first/previous/next/last page of the items in a given folder. You can also set the page size by using a drop down. This fix is also applied on the modal views too, where you can see that how the modal works in a responsive way. Be aware that everything is client-side. No changes in the media controller. 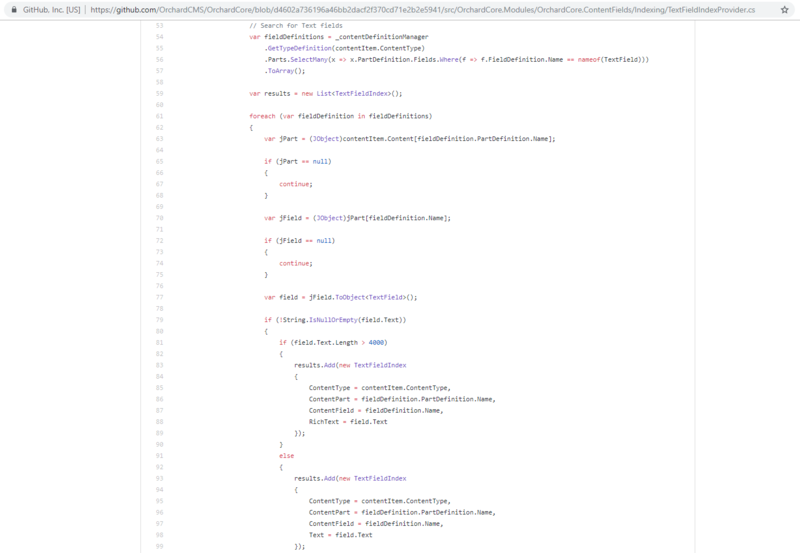 So, if you browse a folder with hundreds of files you get a JSON with all the files. You pay a penalty on first load, but after that then the navigation through pages is faster, without new requests to the server. When we use YesSQL and save the document, the ID of the document is generated on the client side, meaning when we call save then we get a new ID. This ID has to be unique for the database. There was only one strategy to do that: using the Hi/Lo algorithm, but for SQLite that was problematic, so for SQLite we use default ID generator (UseDefaultIdGenerator()) which is just a static in memory increment. In SQLite we can just run with one node, it makes sense to optimize the rest to be also adaptive to this mode. So, there is no database access to generate an ID, but for the other servers, it's using the Block Id Genereator (UseBlockIdGenerator()), which was the previous default logic, which is leasing a range of IDs like 20 by default (from 1 to 20 and then from 21 to 40 and so on) and each client has a lease of unique set of attributed IDs and another node might have another ranch. When you have created 20 items with your client than it will issue a new request to the database to lease a new ranch that other nodes won't be able to lease. The idea was to prevent some locking issues that we find that mostly comes with workflow definitions. 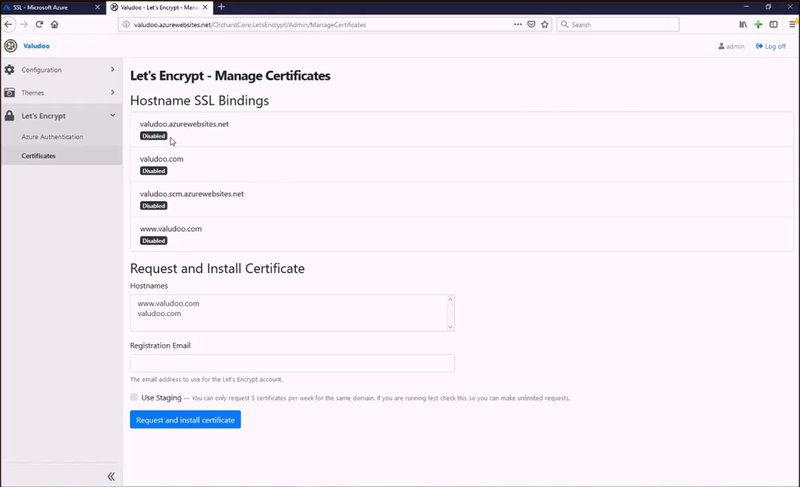 By using the Let's Encrypt module we can get SSL certificates automatically when hosting your sites in Azure using Azure App Service. Support for other scenarios will come later. 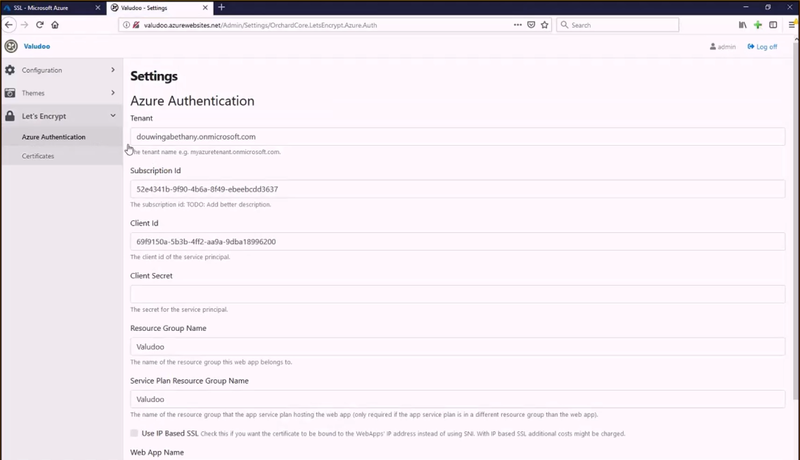 In the menu you will see a Let's Encrypt option with the submenu items: Azure Authentication and Certificates. Under Azure Authentication you can set up the necessary settings to talk to the Azure API to add the certificate and do the binding. Under the Certificates menu you can see the list of your bindings under Hostname SSL Bindings. When you click on the Request and install certificate button, you will get a new Let's Encrypt account with the email address typed in the Registration Email textbox. It also verifies that you own the hostnames and install the certificate to Azure then makes the bindings. The module is still in development and it will get more features in the future. A field indexation was added to be able to search for fields. 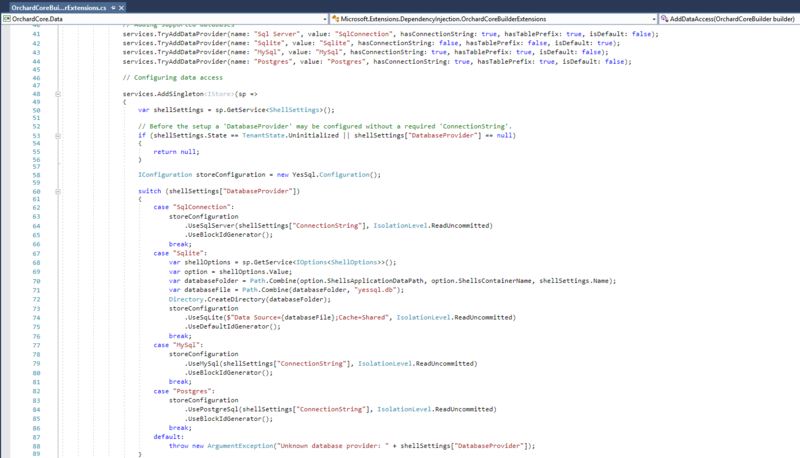 For that there is a new TextFieldIndexProvider. Until now, when we want to do queries on the field data we have to use the Lucene queries, because only Lucene is indexing the field content. So, you could only use Lucene. If you want to do a filter screen to search for things you would have to enable Lucene and do a Lucene query to find the things. But you need Lucene and Lucene indexing to work. Sometimes you need to do SQL queries, because you have the data in SQL and it's easier, you do not have to use Lucene to do that. We didn't have the fields data inside tables that we can query, it's currently inside a JSON document, but not projected in tables so we can't query them. This PR contains a logic that when we save a content item, it will extract all the field content into specific tables for each field. So, each field will have its own index. The TextFieldIndexProvider is for when every time a content item is saved by YesSQL, it will look in this content item and if there is a field of type text, and for any field of type text on this content item, a new record will be created in the TextFieldIndex table with the values.